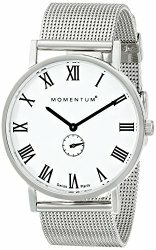 This sleek all silver momentum watch is made with durable mineral crystal and is also water resistant up to 99 feet. This stylish but sturdy sterling silver has swiss quartz movement and stunning white face. This new all pink analog watch is one of a kind! With an all pink band and rose gold tone, this water resistant, two-tone and Swarovski Crystals watch will glitter on your girlfriends wrist. Featuring black accents along the perimeter of this stunning Kate Spade watch, a contrasting white leather band, and mineral crystal face to protect against scratches, this watch is a necessity. Water resistant up to 99 meters this watch is durable and fashionable.